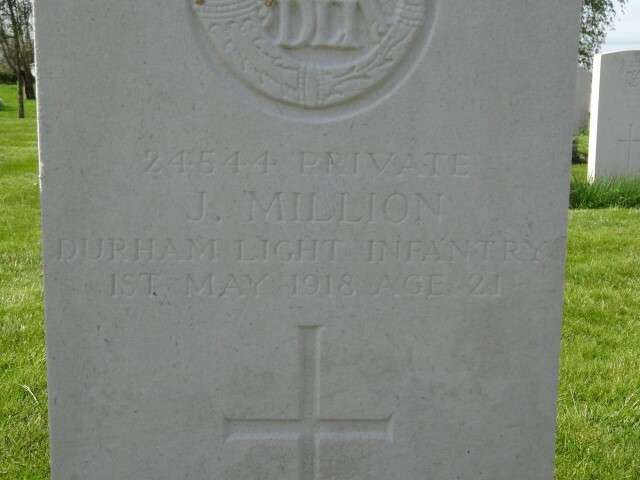 24544 Private Jonas Million, 15th Battalion, the Durham Light Infantry died of wounds 1 May 1918 and is buried at Grootobeek British Cemetery, Belgium. He was 21 years old and is commemorated on the West Auckland War Memorial and the Roll of Honour, West Auckland. Jonas Million was born 31 December 1896  at West Auckland. In 1901, Jonas Million lived with Jonas and Margaret Parkin and their family at Bildershaw, West Auckland. In 1911, he was recorded as the adopted son of 55 year old Jonas Parkin and lived at Low End, West Auckland. Other family members were his son 34 year old Thomas, his daughter 33 year old Mary Ann and her 39 year old husband George Rewcastle and 11 year old grand-daughter Celina Ann. All 3 men worked as coal miners (hewers) and 15 year old Jonas was employed as a coal miner (pony driver). The Division crossed into France 13 September 1915 and their first action was at The Battle of Loos in September 1915. Private J. Million entered France 9 October 1915 presumably as a draft to replace those lost at the Battle of Loos. The 21st Division then saw action throughout 1916 on the Somme and during 1917 at Arras, Passchendaele and Cambrai. Then in 1918, the Division encountered the full might of the German Spring Offensive. It was essential that final victory was gained before the American Forces arrived in Europe in huge numbers. America had entered the war 6 April 1917 and the first of her troops arrived in France 26 June 1917. In July 1917, Pershing General of the Armies of the United States asked for 3 million men. The build-up of troops took time but eventually by June 1918, the Americans were receiving about 250,000 men a month in France. This amounted to 25 divisions in or behind the battle zone and another 55 in the United States. The April offensive against the British in Flanders was estimated to have cost 120,000 men out of a total of 800,000. 9 April: the German forces overwhelmed the Portuguese at Bois Grenier. 10 April: the 64th Brigade was near Polderhoek and 15/DLI moved up to Glencorse Wood. The enemy launched an attack on the Messines Ridge. 11 April: 15/DLI brought back to Lankhof Camp, 1½ south of Ypres. 16 April: 5am a furious bombardment preceded a fierce attack and the village of Wytschaete was lost. 18 April: 5.30am, 15/DLI attacked Somer Farm and won a trench in front of it. 20 – 24 April: 15/DLI in trenches and under steady bombardment until relieved by 5/West Yorkshire Regiment. Enemy drenched the back areas with gas shells and the 15/DLI sent to hold trenches north of Kemmel village to hold a gap in the front as the Germans thrust forward on the 25th. 9/KOYLI supported by 15/DLI counter attacked and reached the Kemmel-Vierstraat road. 26 April: at midnight all that was left of the 2 battalions was about 160 men each. 29 April: the Germans attacked again, 15/DLI reached Steenvoorde the same night. Later research records that between 16 and 1 May 15/DLI lost 1 Officer and 68 Other Ranks including Private J. Million who died of wounds 1 May 1918. Private J. Million was awarded the 1914-1915 Star, British War and Victory medals. The effects of Private J. Million were forwarded to Jonas Parkin who was recorded as his uncle.